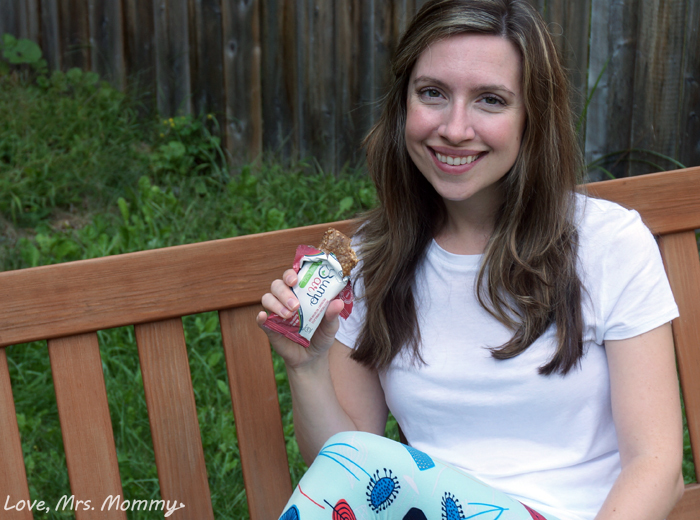 Love, Mrs. Mommy: Support Your Pregnancy Diet and Curb your Nausea with BumpBar! 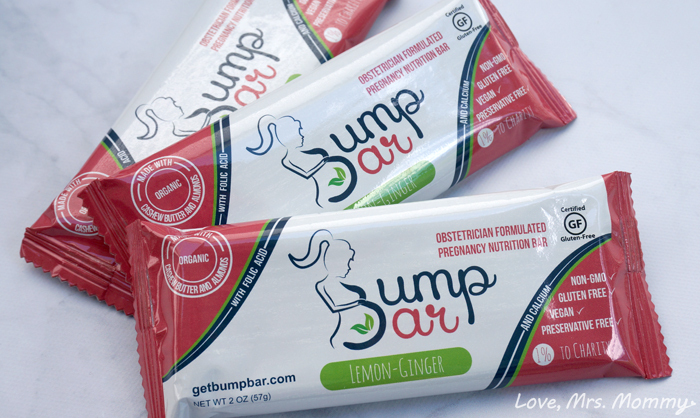 Support Your Pregnancy Diet and Curb your Nausea with BumpBar! I received BumpBars at no cost to facilitate this review. All opinions are my own. Unfortunately, for the first few months of your pregnancy, you don’t feel your best. They call it Morning Sickness, but mine was definitely later in the day. It always seemed to ramp up around dinner time. I needed dinner, when I needed dinner… otherwise, watch out! Haha. There are some ways to curb your morning sickness and I am excited to let you in on this knowledge… introducing BumpBar! BumpBar is an obstetrician formulated pregnancy nutrition bar. It’s non-gmo, certified gluten-free, vegan, preservative free and contains folic acid, calcium, and iron! A healthy way to get the nutrients you need for both you and your baby. BumpBar is tasty treat to carry in your handbag, keep at work, and of course at home. It’s also an easy and convenient way to increase your energy levels, and reduce nausea (it contains ginger). Note: Please know that BumpBar is intended to complement, not replace, prenatal vitamins. Please consult your physician about prenatal vitamins and pregnancy nutrition in general. Did you know that women only need about 300 extra calories a day to support a healthy pregnancy? I was shocked when I found out, I expected the number to be much higher! Each bar contains 243 calories, which almost gets you there on its own! BumpBar makes a perfect gift for a loved one who just found out they are pregnant. Or, give them as a baby shower present! These bars would also be a great way to keep your nutrients up after delivery, if you are planning on breastfeeding. Here’s another reason to love BumpBar... they donate 1% of their profits to a variety of grassroots charities. These organizations include assisting victims of domestic violence, providing emergency shelter for the homeless, promoting outdoor safety and recreation opportunities, and conserving wildlife. I think that is amazing! Connect: Find out more about BumpBar by visiting their website. Then make sure you “like” them on Facebook and follow them on Twitter. Buy It: Click here to purchase BumpBar! Will be sharing this with my daughter, Gena, who is 7 months pregnant! it looks great! Interesting enough. I will pass this along to my niece. I think these sound great. I love the idea of using them after baby arrives while breastfeeding. Quick grab, healthy snacks are a must! I never heard of this brand. I am going to look for this brand. They sound like a great product I'll have to look for them. This is a more palatable way to take ginger for pregnancy nausea! Convenient and healthy, who could ask for more! These sound awesome! Love that they're vegan. My daughter in law is pregnant, shed really like these bars. Sounds yummy, I like that they contain folic acid and ginger. What a great idea for pregnant women. I love the name, lol. Thanks for sharing! What a great name, will have to look for these! Oooh what a brilliant product!! I would've loved these when I was pregnant!! Where was this when I needed it!!!! Would be great if it does work. Great nutrition! These are really great for any expectant Mommy. Always nice to have a couple of easy snacks in your bag as you never know when hunger or queasiness will set in. These actually sound yummy. Other bars don't look or taste nearly as good. These look like an easy way to get in a snack with the bonus of added vitamins. Thank you for sharing. I like that they do donate some of the profit. I would love to try thesefor next pregnancy. These sound great! I'm always struggling to get enough iron in my diet. These sound delicious and an easy and convenient snack. Will be using these the rest of my pregnancy and after, while breastfeeding. As a victim of domestic violence I love that some of the profit is donated to charity! I love the convenience of the bar. I'd definitely throw one in my work bag every day. These sound great. Wish I knew about them a couple months sooner. This sounds like an awesome product and I am happy the donate part of the price. The bars make it handy to have where ever you are. Wish I had this when I was pregnant! I wish I had had this when I was pregnant with my son. I was so sick for months..... this would have been awesome for sure. I am going to tell my sister in law about this.... she needs a little help with morning sickness. Thanks for sharing! I would never need this. I never had morning sickness with my son and I never got hungry within my first 3 months of pregnancy. Interesting. I will pass along to my friends. How awesome that they give back! THESE are great for vitamin intake.